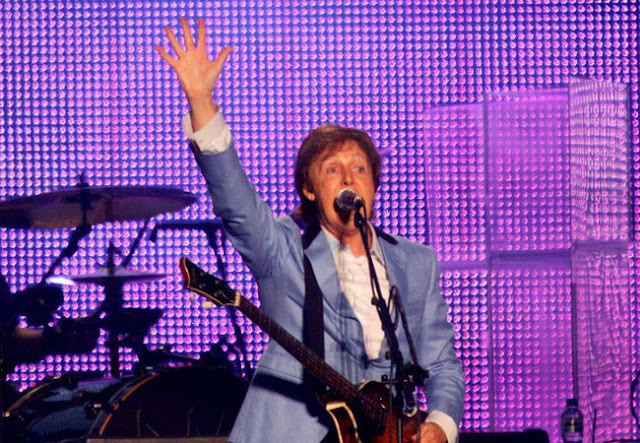 Rio You: Paul McCartney rocked Rio with two incredible concerts!! Paul McCartney rocked Rio with two incredible concerts!! Paul brought Rio de Janeiro to a standstill this week with two staggering concerts in the city, playing to 90,000 delighted fans. The concerts on Sunday (22) and Monday (23) night were Paul’s first in twenty-one years in the city. Paul McCartney posted on Friday (27) on his Facebook page a video thanking his stay in Rio de Janeiro. The singer was in town for two shows with the tour "Up and Coming" 21 years after his last appearance in Rio. With 1:14 minutes, the video begins with the message "Thank you Rio". Then shows the moment that Paul leaves the hotel Copacabana Palace toward the airport. Recorded from inside the car, you can see he thanking the hotel staff and waving to the legion of fans that awaited him. On the way he also took the opportunity to take some pictures from Rio. Last Tuesday (24), Paul also published a text on his blog talking about the shows and the Brazilian public. “Being in Rio was fantastic from the minute we landed. The crowds around the hotel were bananas! They were just crazy and then it built and built until we did the shows. I love Brazil. I love the fact that they love music, it is a very musical nation. I love music, they love music, so it's a natural connection. The fans were of all ages at the shows. There was a huge young fanbase, which I love, and then there was their parents and even their grandparents, so it is a great spread. The enthusiasm for my music was just mind blowing. So all of us in the band had a fantastic time and we thank the fans for making it all so exciting. While doing 'Hey Jude' when I handed over to the audience to sing the 'na na na na's' suddenly the audience produced these signs. It was such a visual thing. It was very emotional because the fans had gone to all that trouble. They could have just come to the show and watched it but they all communicated before hand to make the special moment happen. They connected with each other, then connected with us and the entire crew. Everyone felt connected. It was very exciting and emotional to see that people care so much." All we have to say is THANK YOU PAUL!!!!! Rainy day and lots of cold, for us!